With our kitchen delightfully humming away, we’re thrilled to be baking with the liturgical year again! 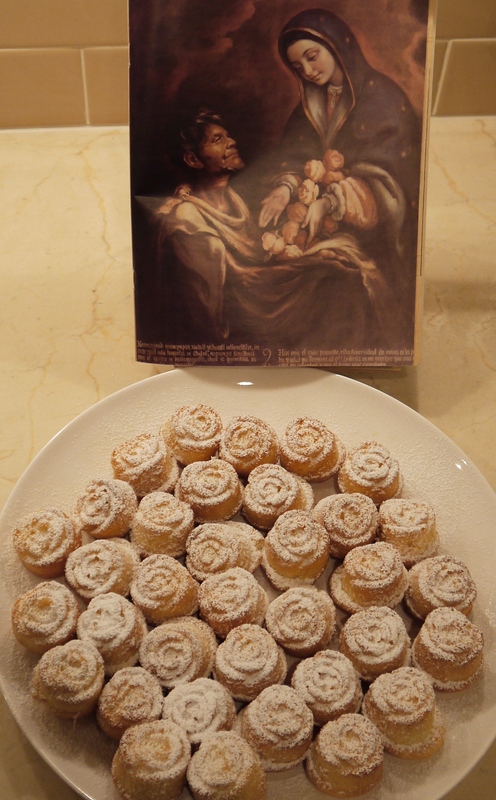 For the Feast of Our Lady of Guadalupe, we made some simple rose cakes with a silicone rose mold. This mold will be perfect for any feast day that is associated with roses – especially St. Therese of Lisieux. The little treats couldn’t have been simpler to make! I started with a basic box cake mix which I picked up at the store – Duncan Hines French Vanilla and a simple orange extract. I haven’t yet found my favorite King Arthur’s Flour orange extract yet…but I’m sure I’ll unpack it and find it at some point! We mixed the cake mix according the package directions, and I added 1 tablespoon of orange extract. I chose orange extract because oranges are traditionally a symbol of Our Lady (and because orangey-citrusy things just…smell…and taste..so festive, dontcha think?). Oranges are a symbol of Our Lady’s purity and in sacred art, you often see oranges or orange trees pictured next to Our Lady. Next time, I’d like to try rose extract to see if that adds a delicate taste of sweet rose. Next, with a tablespoon scoop, we dropped in bits of batter into the rose mold. If you fill the mold to the top with batter, it’s going to puff up, but it’s fine because you’ll turn them over with the rose petals facing up. Still, if you don’t want them to really puff up, fill them about ⅔ with batter. You’ll need to vigorously tap the batter-filled mold in it in order to get the air bubbles out. I didn’t do this with my first batch and the petals are quite full of holes. Another thing I learned is that these brown delicately and bake more evenly if you set the silicone mold directly on the oven rack, not on a baking sheet. Bake these for 20 minutes at 350 degrees and they pop out so easily. 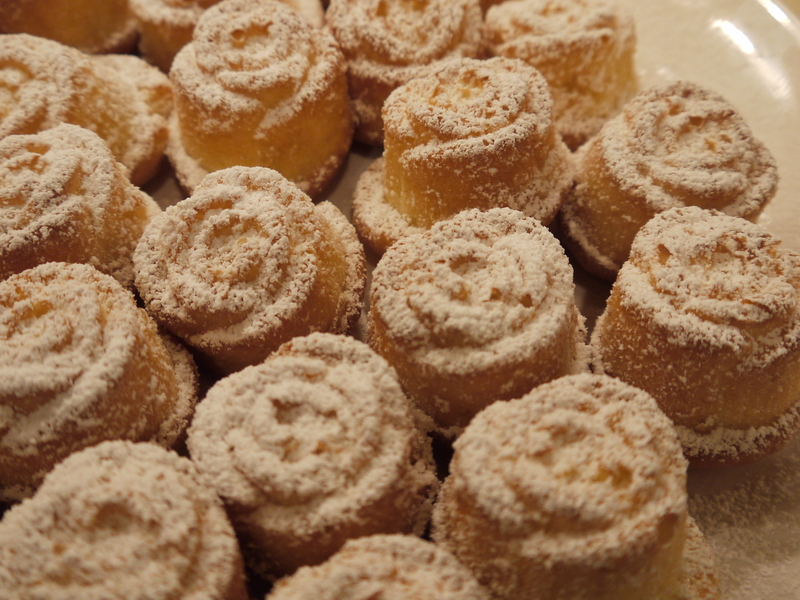 Then just shake a bit of powdered sugar on them! For more ideas for cooking with the Feast of Our Lady of Guadalupe, see the wonderful ideas at Catholic Cuisine. Happy Feast of Our Lady of Guadalupe! I have been debating whether or not to buy the silicone rose mold. You just helped me make up my mind. Your rose cakes look beautiful! Love the rose mold! I have a Therese, so it is definitely going in my Amazon cart! What a beautiful way to celebrate! Am so happy you are posting again! And the print you have of Our Lady of Guadalupe is lovely! Jen, I miss your blog! I hope your remodel is going well and all is well with you and your family! I am really looking forward to more of your posts this coming year. You are always so inspiring to me and have such a lovely eye for beauty.